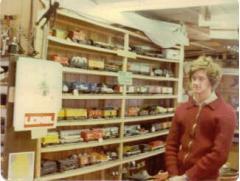 I was just a kid when Dad brought home a whole bunch of model trains that he had purchased from his boss. Overnight, our basement transformed into this exciting world of Lionel trains, interconnected tracks, stations, bridges, tunnels and more. I was thrilled. He was less impressed with my eight-year-old idea of running them into each other, into tin cans—you get the picture. "I'm going to train you to play properly," he informed me, which was fun for a while, but young attention spans being what they are, my interest waned. A few years later, he gave everything to my grandfather. Somewhat miffed—even though I rarely played with them—I hid my favorite piece—the big, black ZW transformer. When Grandfather came to pick up the trains, he and Dad searched everywhere. "Okay, where is it?" said Dad, finally, with that "look." I had to give that up, too. Now they were gone, of course I missed them, so decided to get into HO Scale trains. Back in our basement, I cobbled together a layout for my purchases, complete with a little oil refinery. Figuring I could fix my trains, and maybe pick up I few bucks fixing who knows what, at 13, I embarked on an ambitious, 20-workbook correspondence course from the National Radio Institute in servicing small appliances. It took me two long years, but, at 15, I finally received my big diploma. About the same time, Grandfather, duly impressed with my determination and renewed interest, and about to embark on some life changes, gave me back all the trains Dad had given him. Now I was all set for the big-time. Buoyed by my successful course completion and the return of my Lionel trains, it was time to branch out, though what I did next surprised even me. I came across a daring—you would likely have called it risky—opportunity. Eighty-year-old "Harry Train" from Toledo, struggling with mobility issues, had decided to sell his Trains' Hospital—a Lionel Service Station—for $2,000. In 1975, still a junior in high school, I had no access to that chunk of change. Thankfully, somehow, I talked my parents into co-signing a loan. Next, challenge up was how to get my purchases home. Too young to drive, Dad surprised me by letting my older buddy drive his pickup truck. In Toledo, I can still remember having to use a "fireman's-carry" to bring the elderly "Harry Train" down to his basement to sort out the sale items. With the deal squared away, we hauled everything—including "Harry-Train"—back upstairs and then loaded my new equipment into the back of the pickup. It barely fit! From my junior high school days until I became a senior in college, one-and-a-half bays of my dad's two-and-a-half car garage stayed filled with my train-related equipment. Such a busy time. 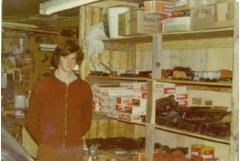 Here I am, 18 or so, in my "garage-repair-shop / store." Train buying, repairs, and selling kept me way too busy—and pretty much out of trouble—through my teen years. I ran classified ads to buy trains; I went to train shows; I sought out trains needing parts or repairs, and basically reconditioned them. A few years ago, I came across an old bookkeeping record showing how I bought ZW transformers for $25, and sold them, reconditioned, for $35. I was on top of the world. I met Milinda when we were seniors in high school. We dated all through college and, somehow, she put up with this craziness. I would call her every Wednesday night and see her on Sundays. If there was a train show in Ohio or Michigan, we went together on Saturdays—sometimes Sundays too. After high school, I headed to the University of Toledo for my electrical engineering degree, commuting fifteen miles daily from my parents' house in Maumee while continuing to run S&G Electric Train and Appliance Service—my train business. Some nights and most Saturdays, a good friend came over to help fix trains, and the odd part-time 13- or 14-year-old "elves" would clean the trains. I built up the business by running classified ads in small newspapers. We were closed in the summers when I worked as a supervisor at CraftMaster where they packaged up Lionel Power-Passers race car sets. Another summer I mixed crop-duster chemicals. The next, I completed an engineering intern at general Mills. Throughout, I continued to build up my personal collection of Lionel trains, and bought parts-inventories from Luelf's hardware in Toledo, and Model's Hobby in Detroit. My last year of college, I placed ads in every newspaper within 30 miles of Toledo, inviting folks to come to S&G to buy trains or get them repaired. I had more business that winter than I could handle! It was so crazy busy that I remember this Saturday-customer, wanting to buy a train, walking out on me because I couldn't get to him! I was a junior in college when I asked Milinda to marry me. We didn't plan on marrying until I graduated, though I had this bright idea that, once married, we could rent an apartment in Toledo, while nights and weekends, I would fix trains in my parents' garage, as I had for years. Thankfully, it dawned on me that my new wife wouldn't be too impressed with that kind of schedule. The big decision had arrived: new wife, or my train repair business. The new wife won, which, I'm pleased to say, was the right decision. Up to that point, I had only interviewed for work with companies based in Toledo. With my big decision behind me, my strategy changed. I only interviewed with companies not based in Toledo. If I stayed, I knew I would get sucked back into repairing and selling model trains. Sadly, the time had come to shut down S&G. During my job search, the S&G details at the bottom of my resume caught the General Electric interviewer's attention. We talked about my train repair business. He asked me if I was interested in management. He went on to describe GE's manufacturing management program that involved four assignments, in varied locations, designed to hit the high spots in manufacturing, quality control, production control, and supervision. Sounded good to me. Then he pulled out a list of GE plants, saying that in Erie Pennsylvania, GE manufactured locomotives. "What? How cool is that? ", I thought. I had no idea that GE made trains, though I had seen GM decals on the Santa Fe's and the 622s. Man, I wanted to work there! GE offered me $20,000 a year, but couldn't say when or where I would start. I accepted. This precipitated another decision. The time had come to sell most of my train inventory. I would keep my personal collection, especially the parts that I had bought from "Harry Train," and other hobby stores along the way. Postwar train parts are hard to find. If you have them, you can fix trains; if you don't, you can't. One day, I would get back into it. That April, of my senior year, my dad accompanied me to York. What didn't sell in the various train shows, was bought by a man in Ohio. The remaining parts returned to Dad's basement where they would ostensibly stay until . . . I retired? I paid back my loan, and with $10,000 still in the bank, the weekend after I graduated from college, I married my high school sweetheart, Milinda. We honeymooned across the back country in the same Chevy van that I had specially carpeted for train shows. We were at Old Faithful the day GE called to let me know that I would be working at the locomotive plant. So, August 17, 1980, I started my post-college career working at GE's Erie locomotive plant. It was a good time, but, happy as we were, guess what Milinda and I missed? . . . Trains! Six months into the GE job, we decided to convert our spare bedroom into a workshop. I retrieved the parts from my parents' basement and hauled them back to Erie. Pretty soon, I was back buying, fixing, and selling trains at train shows. Then GE moved us to Virginia Beach where I had the job of shutting down the last two black and white television production lines in the US. From there they moved us to Cincinnati, from Cincinnati to Louisville, from Louisville back to Cincinnati and from there to Atlanta. We've called Atlanta home, ever since. Train shows never did generate a ton of money, though I remained convinced I could make a living from a trains business. When an indoor flea market opened up Thursday to Sunday—just down the street from my GE office—I talked Milinda into working at a booth. Some days she would sit in that flea market all day and not sell a thing, bless her heart. On Saturdays, when I wasn't at train's shows, I did repairs. After church, on Sundays, we worked at the flea market together. For our nine months of effort with the market, the rewards didn't stack too high. After much mulling, I concluded we needed regular retail space. The both gave us a mere 100 square feet, and with tons of stuff to pack in and haul back and forth to shows . . . it didn't work. So, in 1990 we opened the doors of our first 2,000-square-foot shop in Lawrenceville. Melinda decided to maintain the same schedule as the market, so our Train Works store stayed open Thursday through Sunday. I continued working for General Electric. Somewhere down the line, we hired extra help, which allowed us to stay open seven days a week. 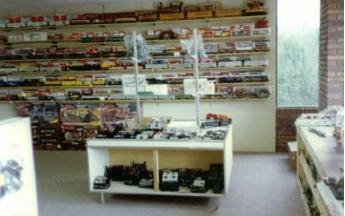 In late 1990 we bought bankruptcy assets from Roswell's The Train Connection, we expanded the store to 2800 square feet. In 1991, our son, Mitch was born. You can see him below at his first train show, and in the store. You can tell it was 1991 from the Santa Fe 11711 set on the counter,.... oops,... I mean you can tell it was 1991 since that was when Mitch was born. Two years and two expansions later we had more than double the space. The train store sales kept up, but cash flow and growth brought challenges. 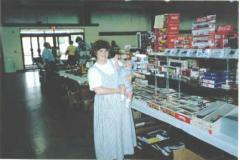 More expansions followed after we bought Southeastern Hobby Depot in Atlanta in 1994. 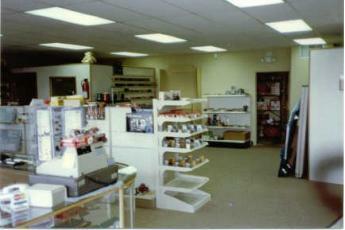 Then in 1995 we remodeled and added a K-Line superstore. Our $187K first year sales would have made the 1995 Inc. 500 list, if the magazine hadn't doubled its threshold to $200K. Although our sales soared, we continued to battle both the cash flow and our bottom line. Even with the impressive sales growth, our high overhead, bank interest from expansions, and a meagre profit margin threatened to sink us. I was still working for GE when, six months later, we bought Southeastern Hobby Depot. Two stores, with total annual revenues over $1M, finally gave me the impetus—after 13 great years—to quit General Electric. Not long after we opened our third store in Roswell. As we continued to struggle in cash-flow hell, the inevitable drew closer. One day, a telemarketer called to offer business consultation at no charge. "Send him over!" I said. The consultant recommended a business-turnaround guy. I signed up. Turned out we hit the train market on many fronts: three retail stores, mail order—with full page ads, direct mail, train shows, and, starting in 1996, lists of products for sale on the Internet. Looking at the business from another's perspective, for the first time, questions flew into my mind. Should I close two stores? Should we stop train shows? Expand the Internet? Get out of the Lionel pre-order business? While money came in, and we sold trains like crazy, the infrastructure and costs left little, if any, profit. "Take an inventory," he insisted. "Are you crazy," I replied. They took way too much time, cost too much, and so what? He didn't buy it. We took an inventory. We sat at a $350,000 inventory shortage. Not good news! He told me we could not recover from it. Worse news! I was already on credit-hold with a number of companies and couldn't get products. Looking back, I realize, I worked almost twenty-four-seven. After a full day, quick dinner at the Waffle House, I would be back at it until midnight. I would drag myself home, check on my sleeping son, and wake my poor wife long enough to say good night. The next day, same thing. Every two weeks—train shows, hoping to sell enough to keep the darn thing running. My suppliers had extended huge lines of credit, so counted on me to keep treading water. Several friends had each loaned me $100,000. My parents had invested tens of thousands of dollars, not to mention a hefty bank loan. If I sank, a lot of people sank with me, which I determined mustn't happen. After some serious discussions, the tough work began. We let everybody go but another and myself, and papered up two of the stores' windows, with notes saying "Closed for inventory." While we still fulfilled mail orders, we tried to figure out how to liquidate the rest. One day, some people in Atlanta called about buying the Brookhaven store. I knew it meant the sales pitch of my life. Honestly, but frankly, I told them that if they could set up the store without loans, they would probably be fine. They liked the idea. We arranged an auction to sell our inventory in one shot. We held the auction in our first Train Works store up in Lawrenceville. Buyers came from as far away as Canada, including the Atlanta store buyers. I provided product lists broken down by manufacturer and price. "Who will start the bidding?" the auctioneer asked. "$10,000," said somebody. I inwardly groaned. "$15,000," another said. Then a man from the bank jumped in with, "$295,000! "—which was what I owed them. Local guys gasped. "$297,000," said the Atlanta team who wanted to buy my store. And that was that. The new owners had acquired our inventory at a fair price. The bank got their loan repaid. It was the best I could have expected. The new owners kept me on the payroll for about six months. After Christmas, out of the goodness of their hearts, they gave me a two-week severance package. December 31st brought the end of 1998 as well as the end of our eight year adventure into train stores. I had given it one hefty piece of my life—and my family's—and I'd learned a ton, besides. Though, while my love of trains remained, right then, I needed a job. One of the investors I had borrowed money from worked at Digital Equipment Corporation (DEC) and he knew of a client that ran a help desk. I had help desk experience from GE. In a telephone interview, I convinced the hiring manager (thanks Jesse) to hire me. We negotiated a salary double what I had paid myself at the train store. Through the whole train stores debacle, I was never without a paycheck. I see now how God truly worked in my life. I thought I was on track as I built the train business, but, looking back, I was a poor husband and have no idea how Milinda put up with me. I was also never around for my son, Mitch. My life focused on climbing the mountain, all the time, almost reaching the top, when things would be smooth sailing. For every obstacle, another rich friend got me through, until God put this $350,000 chasm of missing inventory in front of me and said, "Let me see you jump over that one, Scott!" In hindsight, I see how, when I hit bottom, God carried me through it all. He brought the train store buyers to me; he helped the bank go along with my plan to sell the business for more money than they could, while they continued to grant me enough credit to let our family eat; they also let me keep the store keys and our entire inventory. Then God softened the heart of my DEC investor friend who found me a job that paid almost twice my previous pay! Since the train stores collapsed, I worked for DEC, Compaq and Hewlett Packard while throughout, staying gun-shy over my train hobby. Of course, my love of trains couldn't keep me away forever, especially since I still had a small collection. Way back, my expensive items had been put it into the business, and were gone, but I still owned a few freight cars and Plasticville pieces, so I decided to try to sell them on eBay..
On my first sale on eBay, I didn't know all the rules. A guy emailed me to say he would buy an item if I would end the auction. I thought, hey, that's cool. Unfortunately, new to the rules, I ended the auction without canceling the bids. The highest bidder at the time was naturally upset and left me negative feedback. Not good for my very first eBay sale. I bought my second sale item—a Girls Set—in Dallas, GA. I didn't have the $500 the store was asking, but since I had seen the same thing sell for $700 on eBay, I went home to talk to Milinda. With her blessing, I "borrowed" our house payment money—I had no other cash—and bought the set. Up it went on eBay, where it sold for $750 to these nice folks in Texas. After I explained my "-1" feedback rating to them, the sale went through. Slowly, I started buying at train shows, this time with a mind to selecting items for sale on eBay. Sometimes I won; sometimes I lost. When I saw the high fees charged by the online marketplaces, I conceived of the idea of building my own train hobbyist marketplace. After years off development, in 2003, we launched the Trainz Marketplace, which allowed anyone to buy and sell trains and related items. Items could be listed for free with their own asking price. When items sold, the seller received the asking price, and we received a small listing fee. The site supported multi-step haggling,.... which I thought was pretty awesome at the time! As I waited for the Trainz Marketplace to be developed, I continued to sell on eBay. Pretty soon, we expanded the basement operation until we had five part-timers using the entire basement, garage, dining room, and every place else we could store stuff. Still a little jumpy from our previous ventures, in 2004 we cautiously made a leap of faith when we leased office and warehouse space. That was when our new business moved to its next level. Since those very early days, Trainz.com has expanded tremendously, while benefiting from my experience, and years of hard work with the train stores. In Trainz, we are dedicated to good customer service and accurate descriptions. In 2007 we purchased 13,000 sq. feet of office space. We have grown to 35 full-time employees, and we sell millions of dollars worth of trains annually—and the number keeps growing. Milinda remains amazingly supportive, as she has throughout. She has to be the most patient and wonderful wife to put up with me, and we recently celebrated our 25th anniversary! 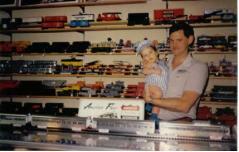 I still really enjoy trains, I love the business, and am very pleased to bring happy train memories to new generations. Thanks to all you great train people for your continued support!